After starting up my own personal blog, I started thinking about ways to make it a bit of a side hustle (oh, and Side Hustle School was inspiring as well). One of the ideas that kept coming up was Google AdSense, a way to display ads on your website. The whole moral dilemma of whether or not to place ads on my blog is something I’ve grappled with and is ultimately a personal choice. Maybe someday I’ll decide to go back to being ad-free, but for now, I’m intrigued to see how lucrative this might be (for a fairly small website, I’m not anticipating a full paycheck but some rainy day funds would be cool). 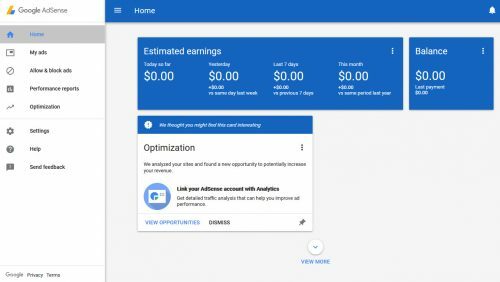 The thing about AdSense — as with a lot of things pertaining to Google — is that a) it changes every so often, and b) you don’t necessarily have a lot of control over it. To get started, you need a website, a Google account, and to visit Google AdSense. Fill out some preliminary information (name, website, etc), and Google will give you a code to copy and paste in your website’s header (don’t worry — they have some tutorials to help). Then, Google will ask you to confirm that the code is ready so they can “review your site.” Although Google tells you the review process can take up to 3 days, I heard back within day 1. After that, you get taken to this lovely-looking dashboard. So Google AdSense offers a few different displaying options for the ads. The relatively easy ones to add are Text & Display ads, In-Feed, and In-Article. In-Feed and In-Article Ads are the ones you’ll see in between a list (feeds) or paragraphs (article). Arguably these are less distracting to your readers, but I have been confused by them before. My first ad was a Text & Display Ad. This type of ad is probably the easiest with which to get started since all you have to do is copy and paste the code and add it … wherever! I chose to put my first one in my site’s sidebar, but I can play around with it or add more ads later. Sure, you could shove an ad in your footer, but the point is for people to see/click on it, so placement is important. It’s a fine line between putting it somewhere that isn’t completely annoying but remains somewhat attention grabbing. This is what it looked like on the front end of my site. Yay Birchbox! Other types of ads are Page Level ads. Anchor ads appear at the very bottom of a mobile screen, while vignette ads will appear while pages are still loading on your website. Quickstart ads are for both desktop and mobile. 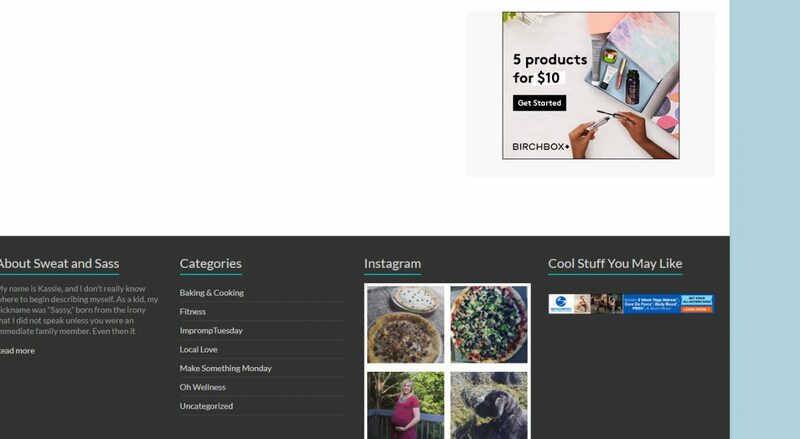 This cluster of ads will only appear on your website or a page on your website a) once you have added the code in the right spot and b) whenever Google thinks it’s a good time to show them. Meaning, Page Level Ads appear entirely at Google’s discretion. If you’re a control-freak, this might not be a good option. While you can limit where the ads appear, you don’t necessarily get to control what’s being advertised (you can set up some restrictions, but this is another “Google decides” thing). You may have to deal with code. Getting page-level ads to display on my website was a bit of a hassle because I had no idea where I was supposed to add the code. Fortunately, there are plenty of people who have decided to share their wisdom with the internet, so I figured it out with some research. Once it’s set up, it seems fairly easy. Like anything, I’m sure I could do more, crazier things to optimize my Google AdSense. If you’re just looking to set something up and “coast” for a bit, that’s totally an option as well. (Keep in mind, Google likes to change things up every now and then so you may have to revisit every so often). Last week I discussed aggressive marketing tactics as part one of strong online stances. In part two, I want to discuss another polarizing issue online: extreme headlines. As a reader, clickbait is offensive for a few reasons, and I don’t mean in the sense of the actual headlines or subject matter. In essence, clickbait assumes that readers are suckers. They basically promise something shiny and exciting, or at least controversial, assuming we’ll fall for it. When clickbait was relatively new, people did tend to fall for it. Now we’ve all wizened up a bit and can recognize clickbait for what it is. By getting all of those clicks, even if people ultimately stay for two seconds after realizing “UGH this is not what I wanted,” it still counts as traffic to the website. The old view is that a website that gets a lot of traffic automatically ranks higher in search engines. While this is true to some extent, clickbait-y articles are starting to get penalized for using such headlines on Facebook by making them less likely to appear in people’s newsfeeds. Techcrunch explains: “The algorithm primarily looks for phrases often used in clickbait headlines but not in legitimate headlines, similar to email spam filter.” When one page/person is consistently publishing stories that offend the algorithm, their posts will get buried more and more (but there is a chance to turn things around-just stop posting clickbait). 1) The giant web hosting banner ad and internet provider video ad (I’m guessing it is just displaying this to be because I am a giant nerd and for someone else, it may display a different ad). This website will no doubt earn money, even if it’s a fraction of a cent, for me seeing that. 2) The giant ‘Login with Facebook’ request. Now that I’ve logged in, they can target me for cheaper advertising, upsell me on a product I might be more likely to buy, or even sell my data to another company. 3) The ads all over to click on additional items (ie go deeper) on the website. By seeing what I click on, they’ll be able to do market research on me (“It turns out women 26-35 are 34% more likely to click on the tattoo quiz than the weakness quiz”) and sell that to companies, sell me on products, or both. Now, as someone who both reads a lot online and writes a lot online, I get it. The downside of clickbait boils down to ethics (a harsher take on clickbait describes it as “misdirection and lying” from this article in The Atlantic). In marketing anything, one of your goals should be to deliver what you promise. In addition to negatively impacting your social media presence, clickbait ruins your credibility and trustworthiness as a marketer, which is something you should value above ranking in Google. That being said, clickbait does not mean the same thing as a clever, enticing headline. Think about it, are you more likely to click on ‘A Balanced View of Coffee Mugs’ or ‘Why I Think Coffee Mugs Are the Dumbest Invention In The World’? As this article from Seriously Simple Marketing says, “As an Internet Marketer, you have an opportunity to be creative and come up with headlines that compel your visitors to click. Just be sure you’re being honest and providing content that delivers on the promise the headline teases.” In other words, deliver on your headline’s promise, and always provide your readers with quality content. Taking a strong stance in a headline/title gets clicks, for the most part, the people that write them enjoy/profit from web traffic and others just enjoy controversy. Aggressive marketing tactics and extreme headlines are two of the three examples of polarizing online stances we’ve seen lately. Stay tuned for our third and final post in this series, about general social media etiquette. This month’s upcoming email newsletter is going to be all about live video. Click here to subscribe if you want to learn more! As non-profits increasingly use video to tell their story (or have individuals try to tell another story as in the Planned Parenthood controversy), live video is going to play an increasingly important role. They are not expected to be highly edited or scripted, meaning production takes less time. They are transparent, as the people in live videos are not only off the cuff but responding to online or real life commenters as the comments are made. So I’ll admit it, I couldn’t find any non-profits using Periscope to solicit donations. There are certainly ideas out there of how it could work but no compelling example. Since people are watching from their phone, they are also paying from their phone. Services like Cash.me were the missing link for me to ‘get it’ in terms of how people can make actual money on Periscope. So why couldn’t someone, live watching you rescue a whale or give a child a pair of shoes, send you money while watching your non-profit doing real work in real time? It’s, of course, easy for non-profits to go right to the donors as a first audience. As a money grubbing capitalist (something I say mostly jokingly), it is certainly where my mind goes first! And I’m sure they used other social media to talk about it. If you missed talking about it and wanted to, I dare say it was your fault. 🙂 So Periscope could be used to get all your colleagues in the ‘same room’ in a way that’s both easier for everyone. As a non-profit, you also have a group of people who benefit from your work. And while we saved this important group for last, I am sure you can also see opportunities with educating those you serve about the work you’re doing with them so you can do it better. The Mayo Clinic has a lot of informational videos (I missed the live #colonoscopy- ‘bum’mer). They get major points for educational content and hashtag usage. Interestingly, they videotape their radio show as well, showing how you can have the same content be in multiple formats to ensure it reaches a large audience. (In putting out these blog posts, I don’t want you to read this and think “Sigh, one more thing we have to do.” Instead, this is meant to inspire you to think “Oh, this would help us solve X issue” or “We’d do Y better with Periscope”.) Like everything online, Periscope is a tool in the giant hardware store that is the internet. And with that in mind, we’re working on a series of these posts about live video so stay tuned! In the meantime, are you brave enough for live video? Let us know! This month’s latest email newsletter will be all about live video. Click here to subscribe to it! April 1, I opened our new coworking space (which will also be where Breaking Even works from). I bulk bought coffee, rush ordered the rack cards, and cleaned the whole place top to bottom. We had built up the excitement, we began targeting our customers months earlier. We were ready. Well, that’s not true. A few friends stopped in to drop off goodies and well wishes. But no paying customers came through that day. We had one paying customer in April. In classic Nicole fashion, I internally (and slightly outwardly) began panicking. It seemed like everyone had wanted to come by while I was covered in paint or when there was no heat on… and over 125 people came through our open house (nothing like free booze on an otherwise boring April evening!) But where is everyone now that the place actually is looking and functioning like a coworking space? Where were the paying customers? I had a glass of wine and called my mom. You know, what any adult would do. Give it time, my Mom said. Others have said. Despite the fact that 300ish people have come through the space, we have had about 30 total customers. Most people are not customers but they’ve come by to see. I see their eyes go up to the security cameras, down to the fancy desks, around the conference room. They ask me questions, they smile, they leave. Part of me wants to be the needy girl with the crush. Do you like me? Why not? How can I make you like me more? Don’t you get how cool I am? Tire kickers aren’t customers… yet. Most people can take a bit of time to be your customers (see our post about sales funnels for further justification). People change jobs, neighborhoods, service providers all the time. So that person who has NEVER bought from you? Let them look at your menu. Let them talk to your staff. Let them get familiar because they may become your customer later. If you are in it for the long game, this tire kicking process won’t frustrate you. I was looking at Anchorspace in a very shortsighted way most of this spring. Not good. “Not yet” is different than “no”, in the way it behaves and the way it feels. A variation on the above point, some industries don’t have much of a lag time between research and purchase. It’s not like you are going to walk around and price 16 ounce beers at all the local establishments before ordering one, for example. But if you’re asking someone to make any decision that is a bit more involved, people are going to need to think on it. They’re going to need to talk to their wife/husband. They’re going to need to run some numbers. Let them. If you have done your research and know your product and market, you can be confident while you wait. Tire kickers have friends… and talk to other people. If you run a steak house and the tire kicker is vegetarian, you may not ever get this person as a customer. And that’s ok. That person has carnivore friends who want a big steak on Friday night… and guess where the tire kicker will send them if they had a good interaction with you? Paying customers don’t have to be your only brand ambassadors. I’ll take a paying customer whether they are from the $1000 monthly retainer client or a guy I went to high school with telling his brother to call me. Ticker kickers are online too. I have a friend who designed her website tenish years ago. “I don’t want to get leads through my site.” she always tells me when we see each other. That’s fine but what I want to tell her (and everyone who thinks this way) even if you don’t want a gazillion dollar website with all the bells and whistles, your customer feels a lot more comfortable silently kicking tires online than doing it right in front of you. That’s why we take care to put a lot of helpful information on this website. So you can kick our tires until your heart is content without us creepily watching you. The virtual tire kickers can be easier to ignore, since we aren’t shaking their hand but instead seeing them recorded as a visit in Google Analytics. The good with the bad. Running an online business has shielded me from the tire kickers (since they just lurk on my site). A physical business has made me know them by name. Anchorspace has given me more anxiety about tire kickers but also it has been more rewarding. I have had things pointed out to me by the slightly skeptical I would have NEVER noticed, and I am thankful for it. I do hope people keep pointing things out and asking questions, even if they aren’t buying because tire kicker feedback is going to make me better. Here’s to the tire kickers. The mullers. The ‘I’ll be in touch’ smiles. The lookie-loos. Here’s to the individuals I hadn’t gotten to meet in real life until owning a business with a physical location. After some thought, revenue, Mom wisdom, and a glass of wine, I’m here to say I’m sorry I panicked over you. I’m grateful you’re here. Keep kicking, my tires and I are ready. *I sometimes get in trouble for using words that other people seem to think have a negative connotation. Urban Dictionary tells me ‘tire kicker’ is much more negative a word than I mean for example. For tire kicker, I mean someone who needs to really understand something before the purchase, who needs to ask questions, test things out, waits before buying and may never buy, etc. Here’s hoping this covers my bases from hate mail but if you have a better term for what I am trying to say, please comment below! Jackie approached a bunch of us about doing a ‘debt is not forever’ post on our blogs in solidarity this January. Many of you know I started off my life as a personal finance blogger. I did it to force myself to learn about the topic and since starting in 2007, I’ve learned a lot about making money, spending money, saving money, and giving money. The best and most basic idea I’ve taken away from all this: don’t spend more money than you make and always put some aside. For several years, I made $10/hour and had to live on it. To force myself not to go into debt, I had to understand where every penny went. I kept a notebook (this is before I had a cell phone- because, you know, I couldn’t afford one!) and wrote down all my purchases for two months. I saw patterns (buying convenience food at higher prices, noticing I couldn’t walk out of TJ Maxx without buying something, etc.) and changed them. A lot of these habits still stick with me today, and I think that’s mostly a good thing. While making $10/hour (ever since my first job actually), I’ve also had an IRA and I’ve put $25/week into it no matter what. When I was more ‘flush’ with cash ($11/hour, wohoo), I started to put $25/week into savings. I used the savings three times: twice to keep the business going and once to go to London. I know what you’re thinking, what does spending wisely and saving money have to do with debt? Well, not much. But the main reason I was able to put money away for savings and retirement even with my modest salary is I have never had debt. This is for two reasons: 1) my parents paid for my college and 2) I’ve always paid cash for cars. Yes, I am grateful. Yes, I am lucky. But not all things remain the same. I eventually fell in love. Gamechanger on the life level and on the finance level. Derrick is very financially responsible but as a homeowner, he had some debt in a home equity line of credit. We did Financial Peace University online together (well, most of it anyway!) within the first year of our relationship to make sure we were on the same page with finances. Regardless of how you feel about Dave Ramsey, the modules made us have conversations we would have never had otherwise. And I’d be lying if I said the first 4 months of budgeting weren’t initially painful. But we kept trying. Relationships are about compromise and it takes awhile to get there. Almost two years later, we still do our monthly budget and pay all our bills. It is painless and takes less than an hour. (So if you are just starting this process and arguing about how much to spend on groceries, take heart, it gets better!) Since we started, we have knocked off the home equity loan entirely while cash flowing our wedding. I would like to say one thing here. I have never resented Derrick for having debt while I didn’t. Not even once, not even a little. He has gotten on the ‘let’s not have debt’ path without resentment. I give him a lot of credit for that! So while our debt didn’t even last two years of our life together, I can say I plan on our love being forever. All this to say debt is not forever and the best ways to deal with it are 1) little by little and 2) avoiding it when you can. I’ll link to all the other Debt Is Not Forever posts once Jackie makes the list live so you can see that my story is among the many ways to make the journey. So take heart this new year and know at least one random woman in Maine is rooting for you to get out of and stay out of debt! My most recent trip to Boston was basically one big learning curve, which may be apparent considering this is the third blog post dedicated to “Things I learned during Wordcamp weekend.” YikYak was fun and delightful, and learning about marketing is always a blast for me- but this latest topic is a bit daunting for me. I’m about to talk money. That is, money and how it’s interacting with the internet, affecting the way we buy things or even interact with each other. Sure, there are online shopping carts and PayPal, but there’s an emerging realm of online currencies and payment processing tools that I was blind to pre-Boston. Bitcoin is a type of cryptocurrency (a very simplified explanation is that it’s a digital currency that isn’t governed by a bank). There are hundreds of different cryptocurrencies out there, apparently (including but not limited to Litecoin, Dogecoin, Namecoin, and one called Chtulu), it just so happens that Bitcoin is the most popular and/or successful. It’s controlled by the people who use it. Who is using Bitcoin? My first, naive impression was that this number would be low, as I assumed people would forgo this “Mario money” for “real money,” but the numbers proved me wrong. In the past 24 hours, there have been about 75,000 transactions via Bitcoin, or a little over 3,000 in the past hour. There’s a couple reasons using Bitcoin appeals to people. First, what you see is what you get. There are no hidden or extra charges with transactions via Bitcoin. Also, vendors don’t receive any personal information from you (credit card numbers, addresses, phone numbers, etc. ), which is ideal considering the amount of security breaches lately. If you’re looking to make some purchases on the sly, Bitcoin probably isn’t for you-all the transactions are logged online (it’s open source, after all). You’re not going to find the privacy of cash only transactions with cryptocurrencies, but then again, we are talking about the internet. 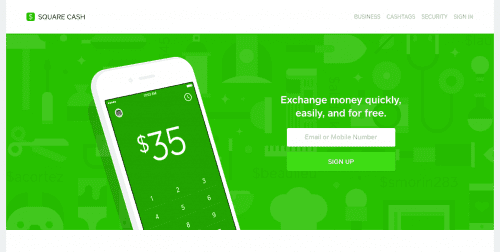 In addition to currency, there are new ways of exchanging money online. PayPal and Square have been around for a little while now, but Venmo is a mobile app designed for smaller scale transactions, mainly between friends and acquaintances. Venmo allows you to pay a friend for lunch, rather than trying to make exact change, directly from your credit card account. Venmo can handle transactions a couple different ways: a) if someone pays you, the balance stays right in your Venmo account, and you can continue to exchange money that way, or b) if someone pays you, you can choose to Cashout and have the money deposited in your bank. Whereas Bitcoin is available internationally, Venmo is only available to people in the U.S.
Venmo is especially popular among millenials, and was designed by a pair of twenty-somethings who were tired of settling up with each other all the time for meals and various activities. According to a Forbes interview with the co-founders, their goal is to”be accepted like Visa and used like Facebook.” It’s pretty ambitious, but $314 million went through Venmo just in the beginning of this year, and the numbers just keep going up. What’s so great about online currency and exchanges? There are countless other apps out there designed to manage money. Even most banks have apps available to mobile users. As a culture, we have come to associate mobile accessibility with convenience, and that appeals to everyone. Don’t just take my word for it- check out this blog post on the current state of the mobile user. During my research process, the one overarching point I noticed is that people want what’s convenient. Trying to split a cash only bill when everyone in the group has only 20s is not convenient, but the ability to pay people back instantly without having to count nickels and dimes? Bingo. Another interesting characteristic shared by Bitcoin and Venmo is the idea of Peer to Peer (or P2P) transactions, or the idea that I could square up with you, and cut out the middleman altogether. Thinking about money still stresses me out, but after learning a bit more about money and exchanges online, at least now it’s convenient.